CAROUSEL: Coronal views of the artist’s brain depict the messiness and chaos of illness. Elizabeth Jameson wants you to look at her. Really look at her. 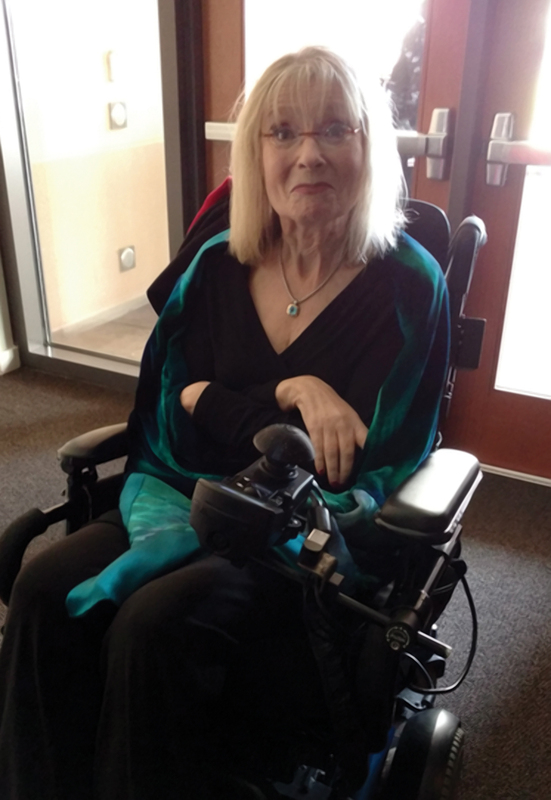 See her high-tech wheelchair, custom fit to her slender body. See her immobile legs and arms, her carefully folded hands. See her shiny blond hair and her penetrating hazel eyes. People often look away from those with disabilities, says Jameson, in the same way they avoid talking about illness. But it is time to change that. 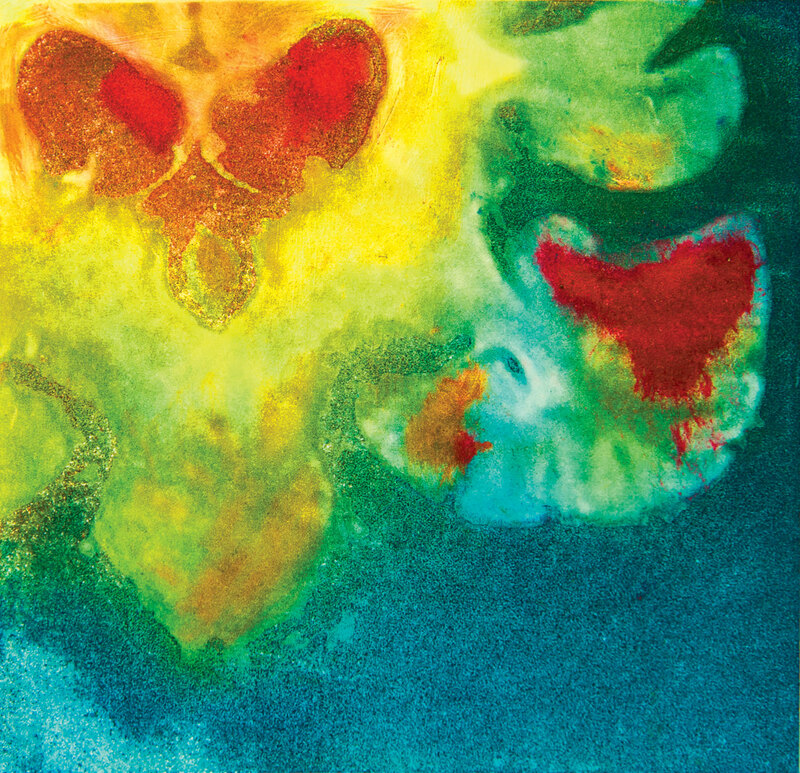 Jameson, ’73, who has multiple sclerosis, uses magnetic resonance imaging of her brain to create art that is intended to provoke conversation about illness and disability as part of the human experience. Artist Elizabeth Jameson (Photo: Cheryl Bowlan)The arresting pieces, with titles such as Emerging, Celebration and Conversations with Myself, have appeared in publications from Scientific American to Fast Company and at galleries and institutions across the country, including Harvard, Yale and the National Institutes of Health. As a child, Jameson says, she admired the nuns who taught her in parochial school, and she considered becoming a nun so she could devote her life to helping people. CELEBRATION: Jameson hoped to lift a friend’s spirits with this Solarplate etching of blood vessels that caught her eye on his brain angiogram. In 1991, Jameson had a busy career and a young family. She was at the park pushing her two sons on the swings one day when she abruptly lost the ability to speak. At first doctors suspected a brain tumor or a stroke. More tests revealed she had multiple sclerosis, a progressive disease of the central nervous system that disrupts the flow of information in the brain and between the brain and the body. Strange symptoms came and went; as time passed, more of them stayed. By 1993, the civil rights attorney struggled to stand or walk. The strength of her voice gradually diminished, and she experienced episodes of aphasia, which made it difficult for her to speak and write. By the mid-1990s, practicing law was no longer possible. Jameson retired with a broken heart. Grieving the loss of her life’s work, she let a friend talk her into attending a community art class. It was the first time she’d held a paintbrush, and she fell in love with the smell and feel of paint. She began painting “obsessively,” she says, but painting still lifes didn’t reflect her new identity as someone living with illness. Nor did it feed her desire to serve a greater good. Her mind kept returning to the stark black-and-white images of her degenerating brain that were accumulating in a corner back at home. VALENTINE: Color highlights heart-shaped structures in this coronal view of Jameson’s brain stem, cerebellum and lateral ventricles. “I had so many MRIs,” she says. “They were black, ugly, scary images I had refused to look at, but it was as if they were tattooed on my forehead. I couldn’t wash them off. Jameson began painting in oil and acrylic and working with silk fabrics and dyes. Then a printmaker introduced her to Solarplate etching, which employs a light-sensitized, steel-backed polymer material used by artists as an alternative to traditional printing techniques. Jameson chooses the section of a black-and-white scan she wants to feature and places it on the Solarplate. When sunlight hits the plate, it creates a relief image that can then be enhanced with ink. The final image is printed on paper. As her disease progressed, her process evolved. Jameson turned to studio assistants for help and expanded into other media, including digital collage and photography. Elizabeth’s artwork opens people’s minds. As people get to know her work, I think their understanding of illness and disability shifts,” says writer-artist Catherine Monahon, one of Jameson’s collaborators and studio assistants. CIRCUITBREAKER NARRATIVE: Jameson created this tapestry to depict the “blown-apart” pieces of her life. 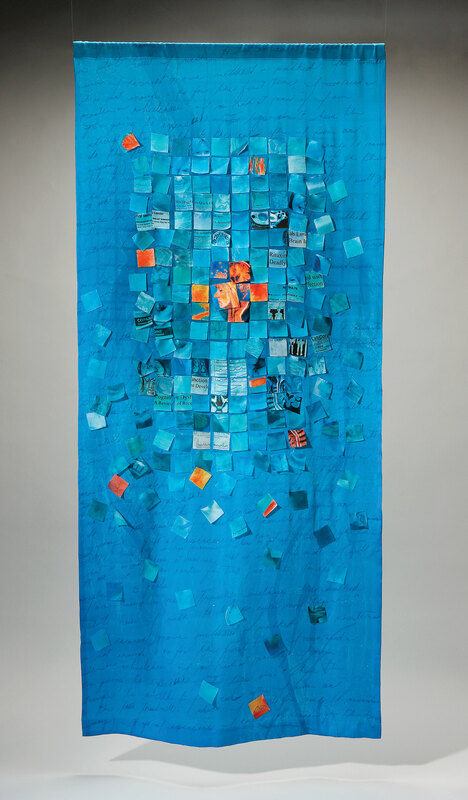 Circuitbreaker Narrative (right), a cobalt blue textile collage, juxtaposes square pieces of MRI scans with scraps of medical reports and pieces of a painted self-portrait. “It describes trying to put the pieces of my life back together, which were blown apart by the tsunami,” Jameson said in her 2017 TEDxStanford talk. 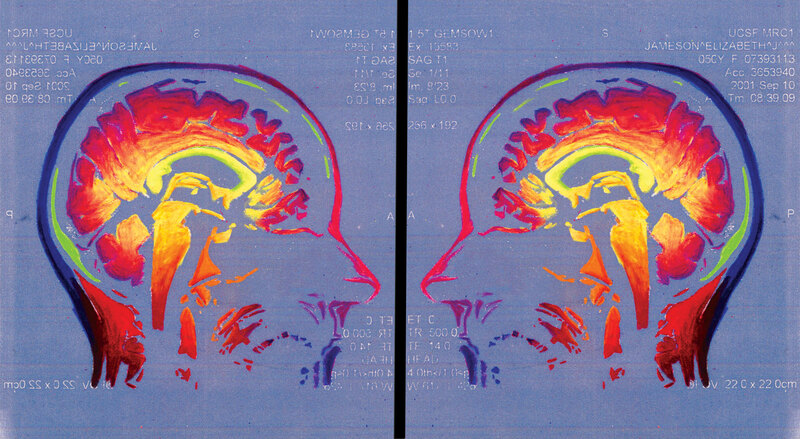 Conversations with Myself is a large horizontal work constructed from two MRIs positioned so they face each other. Medical notes appear in soft white print behind colorfully highlighted side views of Jameson’s brain. “It is inspiring both from a philosophical and certainly from an artistic point of view when an artist turns their lens or brush or scanner inward,” says UCSF neuroscientist Adam Gazzaley, who directs Neuroscape, a research center focusing on technology and the brain. Gazzaley and Jameson worked together on a 2013 PBS special that featured Jameson’s art. BIRD BRAIN: A familiar-looking visage hiding in an MRI inspired the artist to create this series. If one part of Jameson’s mission as a public interest artist is helping healthy people understand the universality of illness and disability, another part is empowering people living with disease to share their feelings and connect with one another. The Waiting Room Project is a multimedia installation for building community in clinical spaces, where patients often experience isolation and anxiety while waiting for treatment or diagnosis. Patients and their family members and caregivers want to connect with others in these moments, Jameson says; she knows because she has asked them. On display in clinics from UCSF to the University of Miami, the installation consists of 3-by-4-inch conversation cards, writing implements and a monitor that displays a slideshow of completed cards. 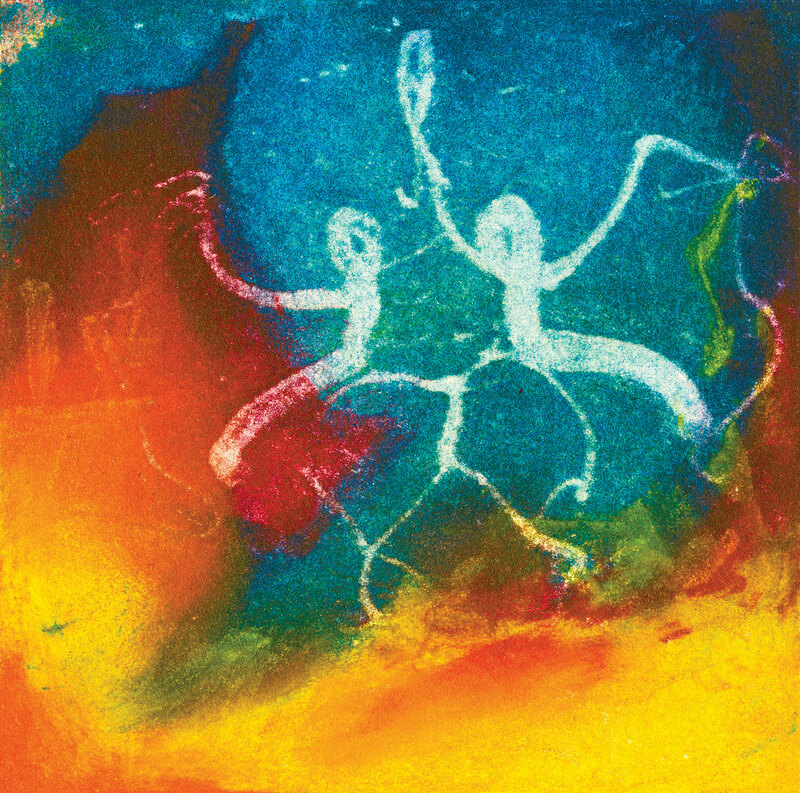 CONVERSATIONS WITH MYSELF: This Solarplate etching and pastel on paper is part of Jameson’s Brain Diaries series. Jameson hopes the project will become a model for other waiting rooms in clinics where those facing chronic illness are treated. For now, she intends to do everything she can to keep the conversations going.